Toasters come in all shapes and sizes, with all types of settings for toasting, browning, bagels, waffles and just about everything else that you could desire in toasting control. But sometimes the simplest appliances are the best appliances and to that end take a look at the Sunbeam Automatic Toastmaster Toaster Model T-35. With virtually no bells or whistles except a lighter or darker setting, this toaster does one thing; it makes toast and it does it automatically. The design comes from the 1950s and it is still going strong today. 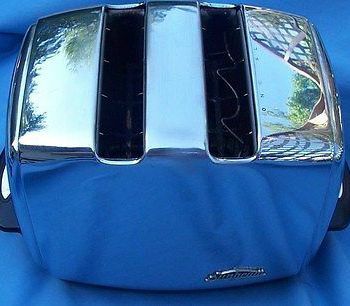 This was the age of chrome plating, and this toaster has that in abundance. And because it is chrome it will look good on virtually any counter top, at the kitchen table or a kitchen island. It has a classic retro look, yet it remains incredibly functional. For a basic toaster with a unique twist, this Sunbeam is hard to beat. The T 35 is no longer manufactured by Sunbeam but you can get vintage and collectible ones still. One place to look is on Ebay. The Toastmaster’s claim to fame is that it is fully automatic. It both lowers and raises the bread once you place it into the toaster slots and although this was an extremely novel idea back in the day it was created, there are several modern toasters that will do the same thing. However, none do it with more panache than the Toastmaster does. Make no mistake about it, this is a toasting machine. It is one of the faster toasters available, and the darkness control will give you a very desirable color. The elements are spaced inside to give you an evenly toasted piece of bread regardless of size, and the bread slots are large enough for bagels, frozen waffles or slices of artisan bread types. Granted, you may have to do some trial and error adjustments for the browning you want done on any given slice, but once set, it will give very reliable results time after time. The way it works is that the thermostat monitors radiant heat from the sides of the bread and when that reaches an ideal level, up pops the toast. This is better than a timer because different slices of bread may heat at different speeds. This is why once you set your desired level of browning, every slice will come out with the same color after that. The Sunbeam Automatic means you just place the bread into the slots and the toaster does the rest. It will then mechanically lower the slices down so that they can be toasted between the heating elements. Once toasted to a golden brown, per your desired toast setting, it will automatically raise the toast back up so that you can grab it and take it out. Insert more bread into the slots and it will, once again, lower them down to be toasted to your liking. That’s really is all there is to it. Check out our demo of how the Sunbeam Toastmaster T-35 works! Chrome plated for an exceptional chic look, especially if you love retro. Automatic mechanical bread lowering. You’ll never hassle with a push-down handle again. Easy to adjust lower dial for the color brown you want your toasted bread to be. It features a big bread crumb access door on the bottom that is easy to open and easy to clean. In most cases, once the access door is opened, virtually all of the crumbs will fall out. It comes with a 48-inch long cord which is perfect if you are at the kitchen table or an island. You should have plenty of cord length no matter where you want to make toast. Big side handles for ease in lifting or moving. A single slice slot if you only want one toasted slice. Simplicity first and foremost. Virtually anyone can use it and make perfect toast every time. A unique look all its own. This is one of the faster toasters on the market, and the more toast you make the faster it gets. The basic machine has been made since the 1950s, so its reliability and durability are legendary. This is a solid and heavy machine having very little plastic in its construction. It will stay put wherever you place it when making toast. The large and simple to grab side handles make it easy to move it around from place to place. There are no bells and whistles. If you want to do more than make toast, frozen waffles or bagels, this isn’t the toaster for you. The all-metal construction has a tendency to get hot after several pieces of toast have been made. You must always use the handles or keep a pair of hot pads available when moving it around. The chrome plating and beautiful shine may not be right for everyone. The chrome will readily show fingerprints and smudges.